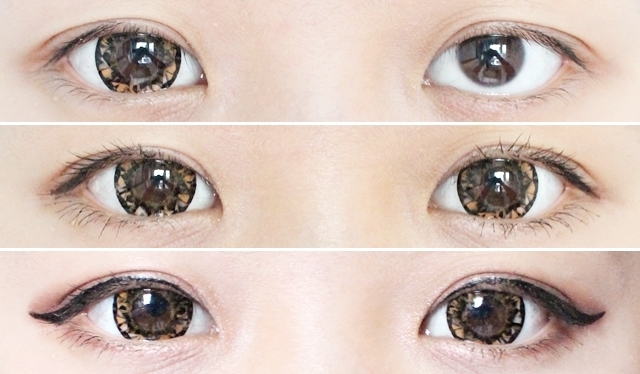 The lenses itself looked very orange when not worn, but after wearing them it looked more brown. The design is definitely way different than the usual ones I wear. It has a diamond pattern that makes my eyes look like a gem! It definitely adds a bit of sparkles to the eyes. Very enlarging for my eyes. It goes into the bug-eyed territory where I look a little funny if I had zero eye makeup. I still look a bit bug-eyed/alien-ish with makeup on as well. Because the diameter of these are bigger, it's not a pair of lenses that I would choose to wear for the whole day (as in more than 8 hours). I was able to wear it for about 3-4 hours before it felt drying. If there are any lenses you would like me to check out, let me know! I'll try my best to find it and review them for you. wow those look huge. it makes me miss wearing super large lenses.